‘The lamps are going out all over Europe, we shall not see them lit again in our life-time’. I watched this service from my parents house in Blackpool, mindful that I would soon be starting work myself in Westminster, having just been appointed as the Digital Outreach Co-Ordinator for Methodist Central Hall Westminster. After the service, we lit a candle in memory of Ernest Topping, my Great Grandmother’s first husband who had been killed in April 1917, just south of Arras, France – at the time the only connection I knew of to the First World War. I have to admit, back in 2014 my knowledge of events of 100 years previous were a little sketchy. I knew about the major battles, (The Somme, Passchendaele and Jutland) but most of my knowledge of the First World War cam from Blackadder! However, given the renewed interest in the media, (who can forget the sight of thousands of actors dressed up in First World War uniforms on the 100th anniversary of the Somme?) and the amazing records available online, I started to research further into my family history during the First World War. On Sunday, 11th November this year (2018), I was invited by the same German musicians who I played for on the 6th November 2014 to join them in Berlin for two jazz services. 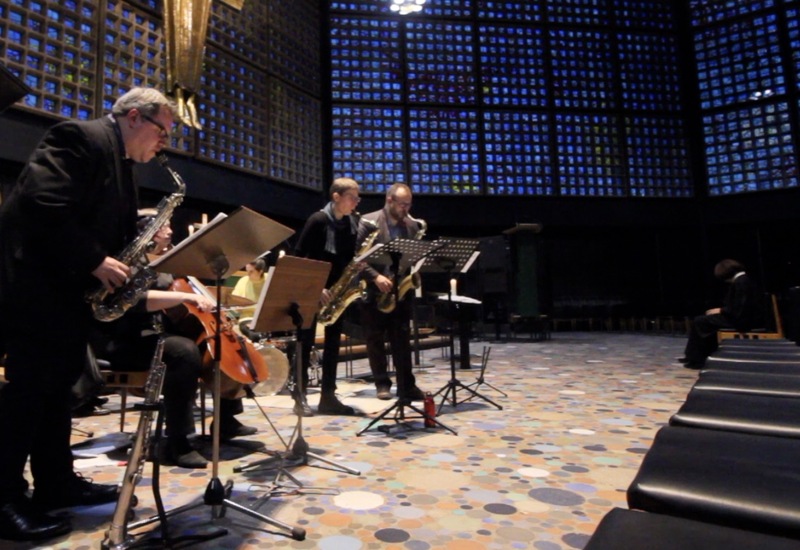 The first took place in the ‘Blue Church’ in the centre of Berlin and was very similar to our own ‘Jazz Vespers’ service. The second was a reflective, late night service with an Israeli singer in the Catholic Cathedral, which is situated in the East of Berlin. We can become very cynical in these trying times, and fearful of history repeating itself. However, I came away from Berlin with a real sense of hope. Because, unlike my Great Grandfathers or Grandfathers, neither my father and I have ever had to fight in Europe – something my German friend Uwe echoed as we travelled to the former East Berlin, and prayed that our own son’s would be able to follow us. We were able to pray together, make music together and shake hands, just as the Queen and German President were doing in Westminster Abbey at exactly the same time. Dan Forshaw, Jazz Vespers Ministry – Methodist Central Hall Westminster.